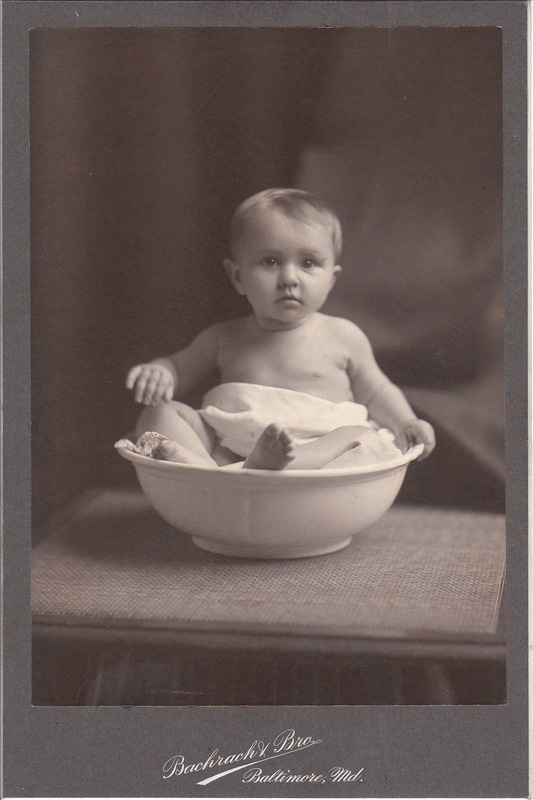 A very cute baby poses for a photographer, artistically placed in a washbowl. The baby appears inquisitive about the proceedings. Bachrach & Bro. is the studio that produced this portrait. The gallery was located in Baltimore, Maryland. Kudos for the photographer for this creative close-up image. The Bachrach studio was nationally known and is still known today. David Bachrach (1845-1921) was an American commercial photographer based in Baltimore. He made significant contributions in technical, artistic and professional advancements in the field of photography. He was a national spokesperson for photographers and published many articles and photographs in photography journals. He experimented with self toning papers and developed the first practical process of photographic printing on canvas, a precursor to photo engraving. Bachrach Inc., founded in 1910, is still headed by the Bachrach family. The company owned studios in all major east coast cities. One of Bachrach’s earliest photographs was taken on assignment to cover the dedication of the Soldiers National Cemetery at Gettysburg in 1863. He photographed President Lincoln delivering what would become, a very famous speech. Bachrach’s home is listed on the National Register of Historic Places. He once shared the home with a celebrated relative, Gertrude Stein. Among his famous portraits are images of Ulysses Grant, Theodore Roosevelt,Mark Twain, and Alexander Graham Bell. Bachrach’s business was truly a family business. Among the relatives who were involved in the business was a brother, a son, and two grandsons.